ScholarshipUniverse creates the easiest, most consistent—and fair—scholarship reviewing process your institution has ever seen. On February 7, Chief Operating Officer Chris Chumley demonstrated scholarship review process features guaranteed to improve your workflows—and your student experience. Fair and consistent application evaluation and awarding processes seem to be top-of-mind for many scholarship administrators. To kick off the session, Chumley asked participants, “What are your three biggest challenges in the scholarship-review process?” Overwhelmingly, the #1 response was, “Managing the application pool” (70%). “Evaluating applicants consistently” came in second; “Manual communication with reviewers and students” was ranked as the third-biggest challenge. Then, toward the end of the webinar, attendees were asked, “From what you’ve seen today, how will ScholarshipUniverse better your institution’s scholarship-review process?” Thirty-two percent of the audience said, “Making more consistent awarding decisions.” That response was followed closely by “Organizing & managing review committees” (24%), and “Establishing better awarding criteria” (20%). 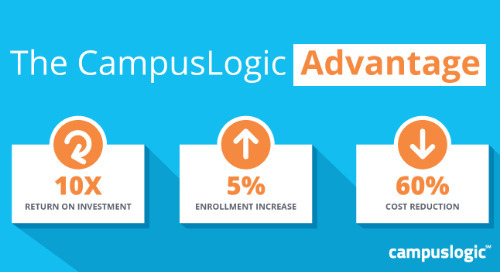 For a link to the on-demand recording, please reach out to us at marketing@campuslogic.com.